So Ed messed around with the Konami Code which does not do what you'd expect it to do. 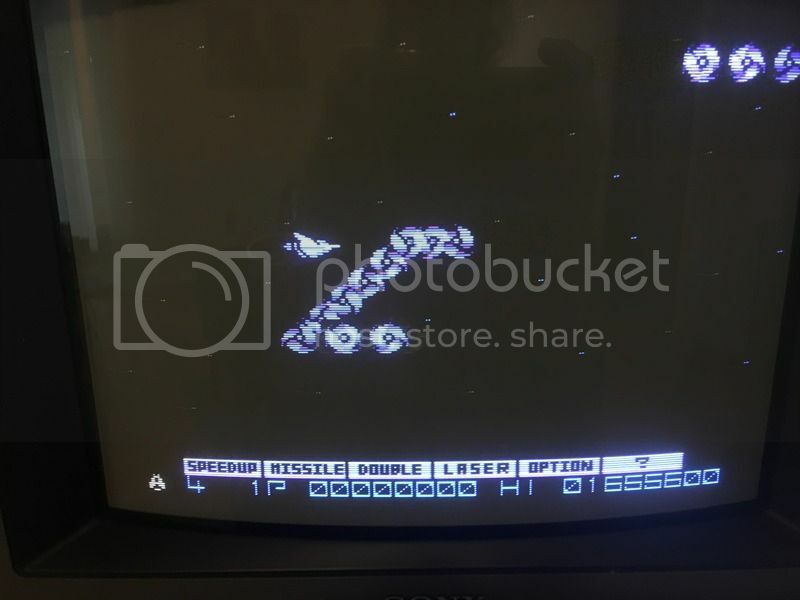 Anyone found any codes or hidden secrets in Gradius? BTW - played the MSX mode for a while last night, and man this game is a miracle of programming and looks fantastic on an F18A system. The only thing this game demonstrates is that someone needs to kickstarter a decent joypad solution for the CV that isn't a hack. No need for that... Atariguy1021 already perfected the drop-in D-pad solution. He sells a finished product on eBay, or you may want to IM him here. I can attest to the commercial quality of the NTT Data repurposed D-Pads. They transform the ColecoVision into the 21st century (or at least post 1986). Yes I did! Thank you and I hope you had (or are having) a good break! anyone else manage to loop this thing yet? I managed to hit the bonus stages in Stonehenge, Moai and Inverted. I have no idea how to get past the inverse volcano, so I have to hit that bonus stage. Cell stage has a bonus level too, but I think you have to kill the first sub boss within two seconds of it turning blue to access it.